In English, we usually use it is when we talk about the weather. It is + verb-ing = This type of weather is happening now. Take an umbrella, it’s raining. Rain: (noun) The game was cancelled because of the rain. Rain: (verb) I think it is going to rain later. Rainy: (adjective) It’s a rainy day. It pays to learn the different forms of each word and when they are used. 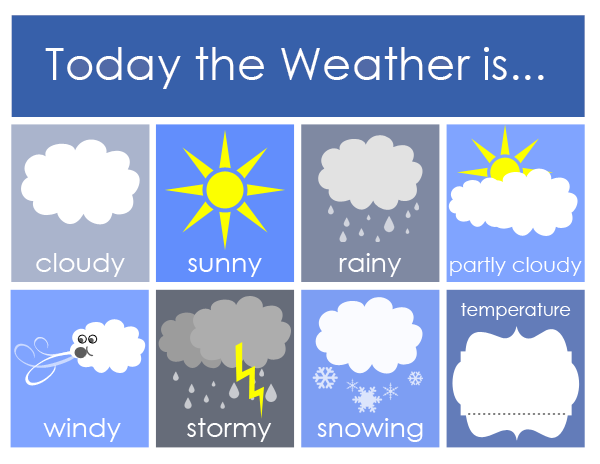 Many times when we are talking about the weather, we can add the letter Y to the end of a noun to make it an adjective. Hail: (verb) when frozen rain falls as small balls of ice (hailstones). Hurricane/cyclone/typhoon: a spiral arrangement of thunderstorms that produce winds and heavy rain. What’s the difference between a hurricane, a typhoon and a cyclone? They are the same thing just with different names because of the region they are in. In United States the word twister is often used instead of tornado. A lot of the crops dried up because of the drought. The forecast says it’s going to rain tomorrow. Lightning: (noun) A flash of light in the sky during a storm. Lightning lit the sky many times that night. Puddle: (noun) a small pool of water on the ground, usually after rain. The kids jumped in the puddles on the way home from school. I took a photo of a beautiful rainbow that was just above the lake. The view of the city wasn’t very good because it was covered in thick smog. Sunburn: (noun) painful red skin caused by spending too long in the hot sun. If you don’t put on your sunscreen, you’ll get sunburn. I could feel the warm sunshine on my back. The cat hid inside because it was scared by the thunder. It is usually chilly and damp in autumn, sometimes with rain or drizzle. I’m so glad there is a breeze right now otherwise it would be very hot. It is so humid that I’ve had to change my shirt twice already. It’s a blustery day; make sure your umbrella doesn’t blow away. Take a sweatshirt because it’s a little chilly outside. Those large hailstones left dents in my car. There has been a gale warning so it’s not safe to go out fishing on our boat. There was a drought in our province last summer. It didn’t rain for three months. We won’t be able to see the solar eclipse because it’s overcast. What’s the weather like in Buenos Aires in January? How’s the weather in Moscow in winter? It’s pretty hot. What’s the temperature? What’s the forecast for tomorrow?